Collects Evil Ernie Vol. 2 #1-6! 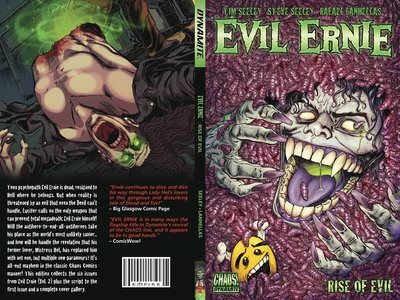 Teen psychopath Evil Ernie is dead, resigned to Hell where he belongs. But when reality is threatened by a force that even the Devil can't handle, Lucifer calls on the only weapon that can prevent total megadeath: Evil Ernie himself! Will the antihero-to-end-all-antiheroes take his place as the world's most unlikely savior... and how will he handle the revelation that his former lover, Mistress Hel, has replaced him with not one, but multiple new paramours? It's all-out mayhem in the classic Chaos Comics manner!